Step aside musicians, it’s time for Nashville’s entrepreneurs to take center stage. Leadership from the Nashville chapter of the Entrepreneurs’ Organization announced today that the city has been chosen to host NERVE, the east coast regional conference for the organization. During NERVE, more than 500 entrepreneurs from throughout the eastern U.S. will gather in Nashville to share ideas, energy and friendship. The event is set to take place Sept. 16-18, 2015 at the Music City Center. In the first quarter of 2013, the global EO organization honored EO Nashville as having the most new members in all 131 chapters, ranking Nashville as the fastest growing EO chapter in the world. For the third consecutive year, the EO Nashville chapter also earned “Rock Star” designation for it 2012-2013 year, placing Nashville within the top tier of EO. “Nashville is becoming a city known not just for its music, but also for its entrepreneurs. This is one more big validation of Nashville as an entrepreneurial center, building on the success of the Nashville Entrepreneur Center and the Southland Conference sponsored by Launch Tennessee,” said Joe Freedman, president of EO Nashville and co-owner of Music City Tents & Events. The 2013 NERVE Conference took place in Charlotte, N.C. in April, and the 2014 conference will be June 11-14 in Philadelphia. Nashville beat out a bid from Boston to host the 2015 conference. Happy Monday EO Nashville members. Here’s your weekly wrap-up for everything that you want to know about EO Nashville members in the news. In August, Dan Hogan [Medalogix] wrote an article for Health Management Technology magazine on incorporating analytics into EMRs. You can read the piece here. 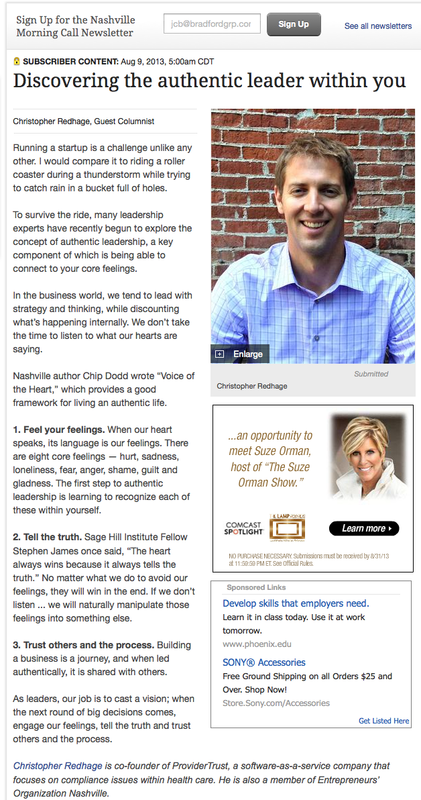 In another installment of EO Nashville guest columns for the Nashville Business Journal, Christopher Redhage [ProviderTrust] published an article about discovering the authentic leader within you. 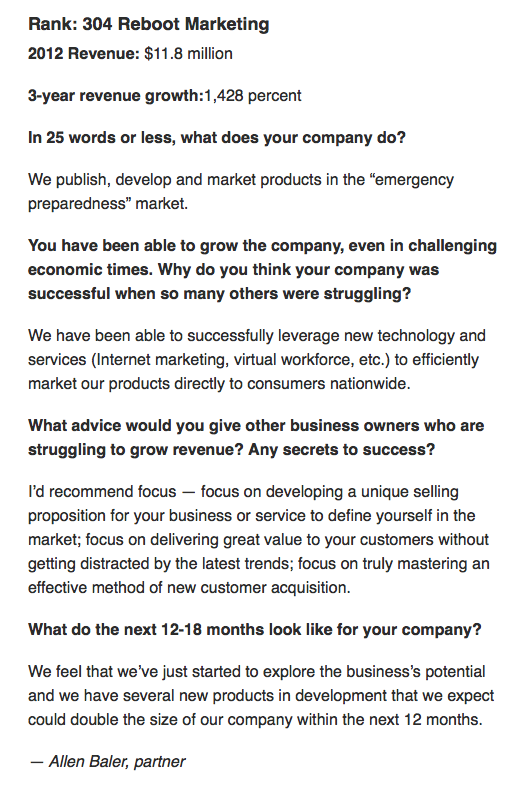 Clint Smith [Emma] was featured in The New York Times on Aug. 14 in an article about Emma’s reinvention of its marketing and communications platform. Alex Tolbert [Bernard Health] opened a third Nashville-area retail store in Cool Springs. 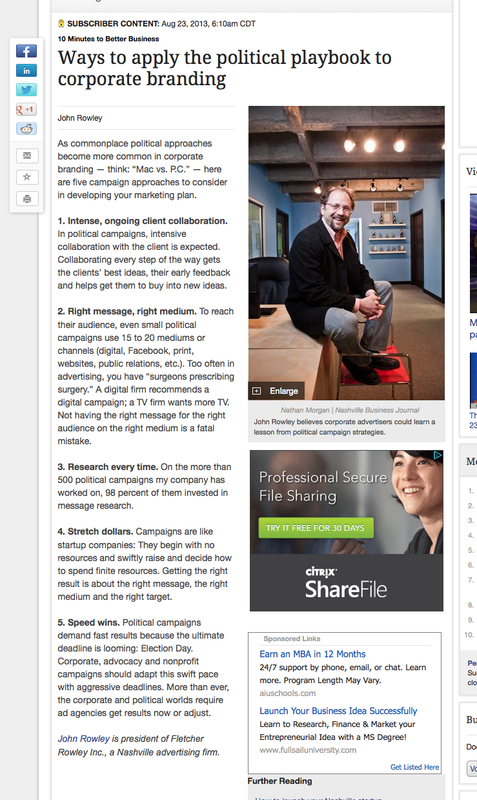 The NBJ and Nashville Post covered the news. Twelve Bone McAllester Norton attorneys, including EO Nashville member Charles Robert Bone, have been named to the 20th edition of the Best Lawyers in America 2014. Check out the clip here. 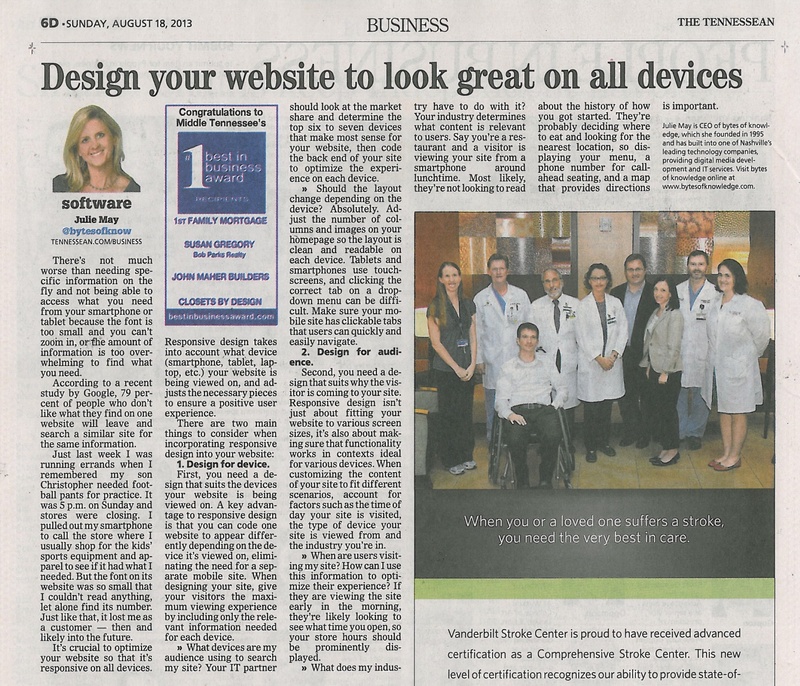 Julie May [bytes of knowledge] wrote a column for yesterday’s Tennessee on responsive Web design. James Fields [Concept Technology] also wrote a column for the Sunday Tennessean. 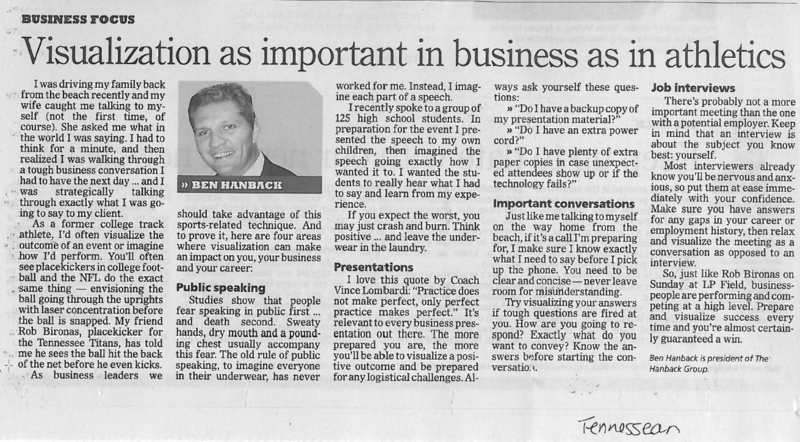 His column was on protecting your online and mobile conversations. You can read it here. Finally, in ongoing coverage of Fletcher Rowley‘s [John Rowley] inclusion in the season premiere of AMC’s “The Pitch,” which ran Aug. 15, AdAge covered the post airing twist: while it looked like Fletcher Rowley “lost,” ultimately, they “won” and was hired. You can read the breakdown here. 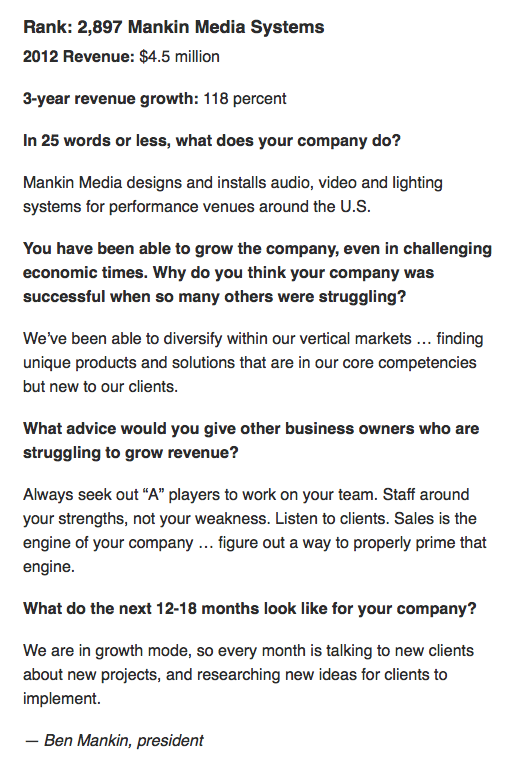 It’s Friday, which means EO Nashville Members in the News wrap-up time. 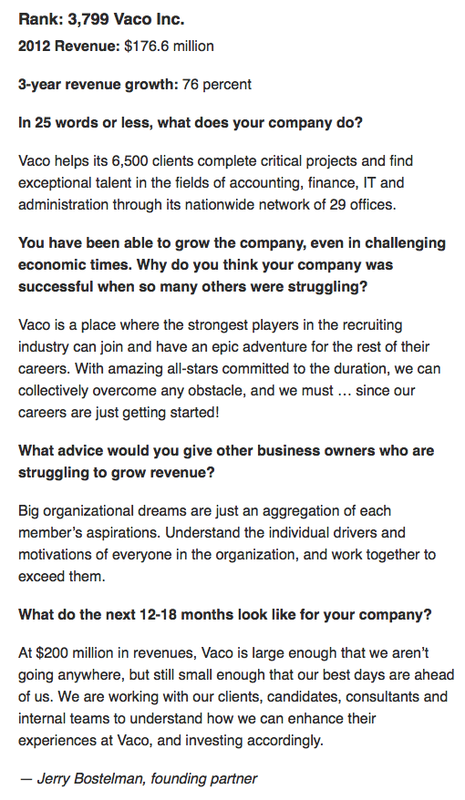 Read on to find out what EO Nashville members are up to. 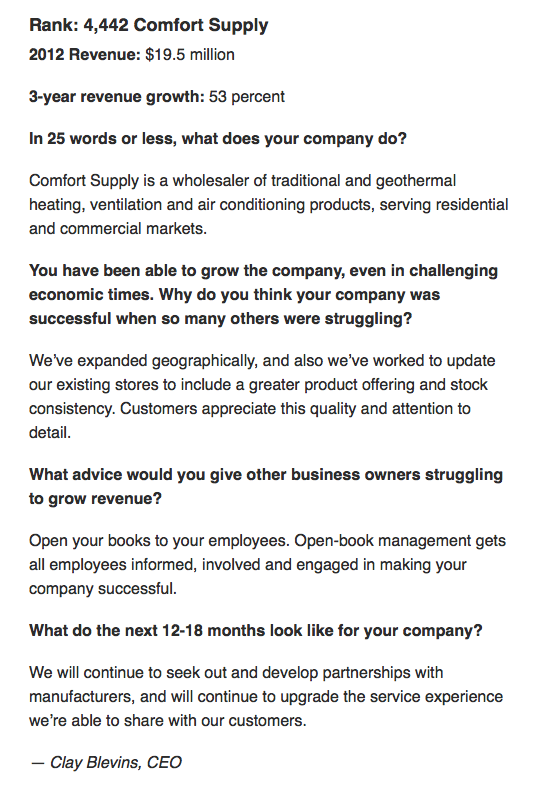 (If you have updates to share, please email them to Erin at erin@bradfordgroup.com). 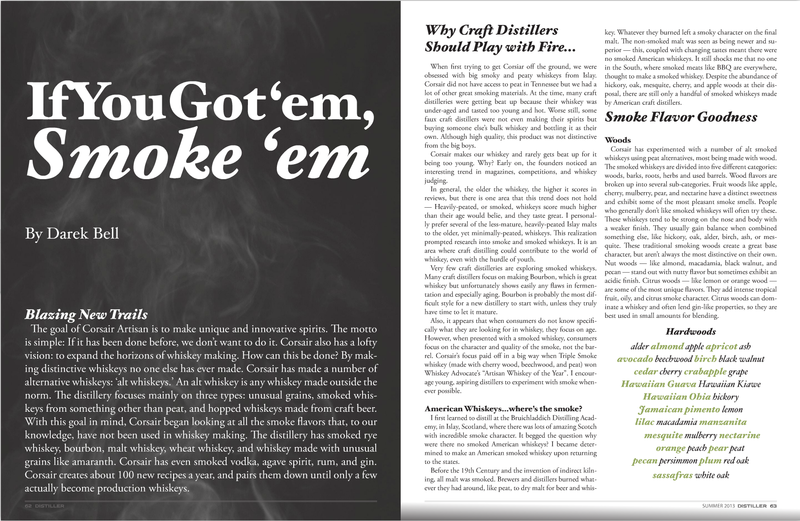 Darek Bell [Corsair Distillery] wrote an article on smoked whiskeys for Distiller Magazine. USA Today also featured Corsair in its “Spirited journey along Tennessee’s Whiskey Trail.” Additionally, Liquor.com included Corsair Red Absinthe in an article about 9 Category-Defying Spirits. Read the article here. Castle Homes [Alan Looney] has been featured several times in various publications and newspapers over the last few weeks for Southern Living’s 2013 Idea House, which the company built. Alex Tolbert [Bernard Health] also penned a column for the Tennessean. His was on the new health insurance exchanges. Alex was also interviewed by Yahoo! Small Business Daily for an article in which he advised employers (with 50 employees or less) to drop their group health plan. The Nashville Post covered The Kirkland Company’s [William Kirkland] representation of the seller of Murfreesboro’s Stones Creek Apartments. You can read about the deal here.